The Suncoast Casino, Hotels and Entertainment (Suncoast), a 1.4 billion investment in the Durban beachfront, stands on the northern bookend of Durban's Golden Mile, as a proud citizen of Durban. It has established itself as one of the key tourist attractions in the Province over the past 15 years. Suncoast contributes well over R100 million a year to the provincial coffers and is now the biggest single investor along Durban's Golden Mile. This is in addition to gaming taxes, and a further R95m towards precinct development including the beachfront upgrade. The current R1.6 billion upgrade will increase the number of restaurants at Suncoast, and includes underground parking and a new high-end Salon Privé. 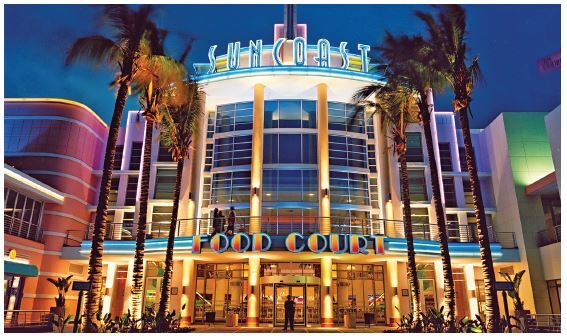 Suncoast comprises 26 hectares of entertainment heaven; offering an array of gaming, shopping and entertainment recreations, Suncoast has something for the whole family with its 20 restaurants and fast food outlets, kids' entertainment, eight cinemas, Sundeck, Boardwalk and a dance bar. The Suncoast Casino has more than 1,550 state of the art coinless slot machines. The main floor is divided to accommodate both smokers and non-smokers. The casino consists of the main casino floor, the smoking casino, the Salon Privé which includes a private game room consisting of 19 high end slot machines. Progressive jackpots provide life-changing wins, while the bars and food stations keep you refreshed. The spa, occupies the entire 9th floor of the hotel, with breath-taking views of the ocean. Each treatment room is designed to provide a peaceful environment that gently stirs the senses, shifting focus from external stress to internal healing and relaxation. The Cinecentre is Suncoast's own movie theatre, where the public can enjoy the very best in the latest Hollywood and Bollywood blockbusters. Featuring state of the art sound and projection technology, the finest in audience comfort and boasting South Africa's largest general release screens, you're guaranteed a phenomenal viewing experience at any of these theatres. For the younger crowd there is plenty to keep them entertained. The Magic Company is guaranteed to keep them busy for hours with fun arcade games, where they can win tickets and cash in on prizes. A crèche is available for children between the ages of three and ten. It offers childcare daily until midnight. The Conference Centre is perfectly positioned on the Golden Mile, offering an electric atmosphere, accented by sophisticated solutions. The conference rooms offer a multitude of function facilities and are specifically designed to meet the needs of the conferencing and eventing market. The Delano and Colony rooms offer two versatile and unique conference facilities with the most sophisticated technology. The Suncoast Towers and SunSquare Suncoast are located in the heart of Durban's Golden Mile and in close proximity to the King Shaka International Airport. The hotels are surrounded by non-stop entertainment, endless golden beaches and breathtaking surroundings with architecture that mirrors the classic Art Deco of Miami. Overlooking the beach, the Sundeck is a magnificent, grassed area, ideal for relaxation and tanning. Switch off and soak up the sunshine whilst enjoying alfresco dining and quality time with friends and family. Experience the best of Durban by taking to the Boardwalk, a local favourite amongst families, cyclists, joggers, rollerbladers and skateboarders. From Suncoast, head north to Moses Mabhida Stadium or go south towards uShaka Marine World or simply sit on the beach and enjoy the view. Blessed with beautiful weather all year round, the Boardwalk is the perfect setting for those lazy summer days. The Sunzone is situated along the boardwalk at Suncoast, with breath-taking views of the Indian Ocean and the Moses Mabhida Stadium acting as a backdrop. The venue is fully carpeted and airconditioned, and can be transformed into a theatrical arena, fine dining banquet or cocktail venue. Suncoast's corporate social investment activity is varied and has focused on primarily education, sports and the arts. They have contributed significant monies to charities in and around Durban and have adopted Vukukhanye Community initiatives as its primary CSI partner. Through an internal programme called CUP (Community Upliftment Programme) Suncoast staff members, make personal time and material contributions to various community projects on a monthly basis. Since 2003, Suncoast has injected close to R4 million into the Suncoast Pirates Lifesaving Club, who provide valuable lifesaving services on Suncoast Beach and a similar amount into the Suncoast Dolphin Cricket Academy, to assist in the development of talented young cricketers in KwaZulu-Natal. Suncoast Casino - Don't miss this Bollywood legend at Suncoast! ONE NIGHT ONLY! Suncoast Casino - Celebrate with great entertainment at the Amashova finish line! Business meets pleasure at SUNCOAST, with spectacular banqueting, conferencing and corporate event facilities. Situated on the beach along Durban's Golden Mile, SUNCOAST is the ideal venue for any function in Durban. There are three beautifully designed, versatile venues, each capable of hosting a variety of functions and events. "THE CONFERENCE & EVENT DESTINATION WITH A DIFFERENCE IN DURBAN"
Suncoast Conference Centre invites you to experience a destination with a difference in Durban - a conference venue where excitement and fun are combined with business and pleasure. Conveniently situated on Durban's North Beach, Suncoast boasts a vibrant atmosphere and offers a multitude of function facilities under one roof. - 100 people - Banquet style at round tables of 10. The 'SuperNova' multi purpose theatre is an ideal venue for conferences, kick-off meetings and product launches for large groups. Situated in the Nu Metro Cinecentre at Suncoast, the 'SuperNova' theatre seats up to 490 uests in luxury seating with writing desks and a large screen of 170m², a perfect venue for high-tech business presentations and product launches.